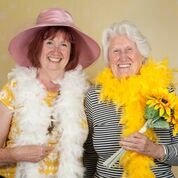 On Wednesday 20th June Vintage Vibes hosted a fantastic summer spectacular afternoon tea at LifeCare. Over 50 volunteers and vips (over 60s) came along an enjoyed tea and cakes, with delicious donations from patisserie valerie, shandon shortbread and biscuitry and vips attending. There was live music and singing from tommy harrower, Alex Duncan and the Vintage Vocals singing group – a great time was had by all! Big thanks to M&S Chesser Avenue, who not only donated £500 to pay for the event but also turned up on the day to be our ‘tea angels’. Thank you guys. Want to host a tea party of your own? Vintage vibes have just launched a vintage tea party set, complete with vintage china, vintage dress up clothes and decorations for you to borrow for fundraiser tea party events!